I have been arguing for years with my colleagues that having house prices go up 10% pr year and salaries only 3-4% means that we have less money, not more. They in turn say that its not a problem since the equity in their house will make up for it. Now I have been trying to argue against this by saying that eventually prices will be so high that interest rates on the mortgage alone can't be keept down, but somehow I always fail at convincing them. So I am looking for a simple, convincing argument for why house prices just can't keep rising indefinitely out of tune with peoples real income. Home 'equity' is a paper gain unless you realize it by selling the house. If you don't, but use the 'home ATM', all you're doing is piling up more debt that's secured on an asset that has downside risk. Ask anybody who's refinanced their house to buy a new boat or SUV in 2006/2007. In other words you're remortgaging the chickens before the eggs hatched. Of course they're also forgetting that all this debt will have to be paid back at some point, and that usually takes income, not equity. In a certain sense the housing market is a pyramid scheme that requires an influx of new buyers to maintain prices. Very simply, if you can't sell your house to buy a bigger one because the first time buyer you're trying to sell it to can't afford the down payment or the payment on the mortgage, then you can't sell your house to buy a bigger/better/nicer one and the next person in the chain can't sell his/hers. Cue the domino effect. House prices are only sustainable if people actually can afford to buy houses and if there's a massive disconnect between house prices and salaries, then house prices will fall eventually. It might just take a little longer depending on the amount of creative financing options that will eventually dry up. "Indefinitely" is easy to answer. Assume that the average house currently costs four times the average salary, and that house prices rise 1% faster than salaries indefinitely. Then in only 1,000 years' time, the average house will cost around 84,000 times the average salary. In 10,000 years, it will be 6.5*10E43 times the average salary. That doesn't seem plausible to me. If you want arguments about "for the foreseeable future", instead of "indefinitely", then that's harder. Those folks should be introduced to some real estate folks I know, they'd get along famously, being as how they still think it's 2007. The amount of housing out there requires that a large market of consumers is available to purchase them. If housing prices rose infinitely ahead of salaries, the market for potential buyers would continue to shrink until supply would outstrip demand. And then we have the wonderful housing bubble like the one that we just went through (or in some places like China, have the potential to go through). Short version: It violates the relationship between supply and demand. Here's another way to think about. Let's assume it is 2011 and we have a married couple who are 25 and make a combined salary of $50,000/yr net. A suitable first house in their area is $300,000, six times their annual net salary. Assuming they could scrimp so that 1/2 of take-home went toward saving for their home, they could save enough to buy the house using cash in 12 years, at the age of 37. Onerous, but they could do it. But now let's allow salaries to increase by 3% a year and homes at 10%/yr, as in your question, and let's run things out for 20 years. Now a 25 year old couple at the same sort of jobs would be making $87,675/yr. But the houses in that town would be worth not $300k but $1,834,772. Instead of six times their salary, a house is now nearly 21 times their salary. This means that if they saved 1/2 of take-home to save up for a house, they could afford to buy the house using cash when they were 67 years old. It gets worse quickly. If you run it out for just ten more years, to 30 years, a couple would be able to buy the house -- at $4.8 million or 40x a year's salary -- in cash when they were 105 years old. (Let's hope they ate brown rice). Mortgages can't save them, since even if they could put down ten years' worth of savings on the 2041 house (that'd be 14% down), they'd still carry a $4.1 million mortgage with a $118k annual net salary. They can't keep rising with respect to people's income because eventually you run out of buyers. If there's roughly one house for every five people, then you'd better make sure that the price you set to sell your house is affordable to people in the upper fifth of income scales, or else you are mathematically guaranteed not to have any customers. Now, it's true that the price of particular houses can get much higher, but they tended to be higher in the first place. Housing isn't exactly an efficient market, but for the most part you have to pay for the house that you get, or else someone else will outbid you. An individual area might, temporarily, buck these trends because it suddenly becomes popular and there are a lot of extra buyers putting money on the table. In the long run, someone is going to build for those buyers, even if it means moving up the chain from enormous rural lots to suburban single-family homes to low-density garden apartments to residential towers. The three basic needs are food, clothing, and shelter. Housing falls into the third category. Because it is "basic," housing takes up a large part of one's disposable income. The rule of thumb is that you shouldn't spend more than 25% of your income on rent or mortgages. And that is income BEFORE taxes. Anything much more than that takes up too much of one's budget. You simply CAN'T double housing's share of the budget from 25% to 50%. Whereas, it's easy to go from 1% to 2% for say, a cellphone upgrade. In the long run, housing prices are constrained by the size of people's housing budgets, which in turn are tied to incomes. Nowadays, that includes FOREIGN buyers. So there may be a case where west coast housing prices are driven up by Asian buyers, or Florida housing by buyers from Latin America, driving Americans out of local markets. There's a few things going on here. If we fixed rates (and terms) over time we'd expect a pretty tight chart of home prices to income, almost lockstep. Add a layer of growth above that in boom times due to the wealth effect (when stocks are way up, we have extra money to blow on bigger houses) and the opposite when markets are down. Next, the effect of rates. With long term rates dropping from 14% in 1985 to 5% in 2003, the amount that can be bought for the same monthly payment rises dramatically as rates fall. Easy to lose site of that and the fact that the average size house has increased about 1.5% per year over the last 40 years, surely that can't continue. When you normalize all these factors, houses cost fewer hours-worked almost at the peak of the market than 25 years ago. Mike's logical example of extrapolating out is very clever, I like it. In the short term, we'll see periods that are booms and busts, but actual prices will straddle the line representing the borrowing power of a week's pay. The big problem with your argument is the 10% per year figure, because in the long term (especially if adjusted for inflation) the prices have not been going up nearly that fast. 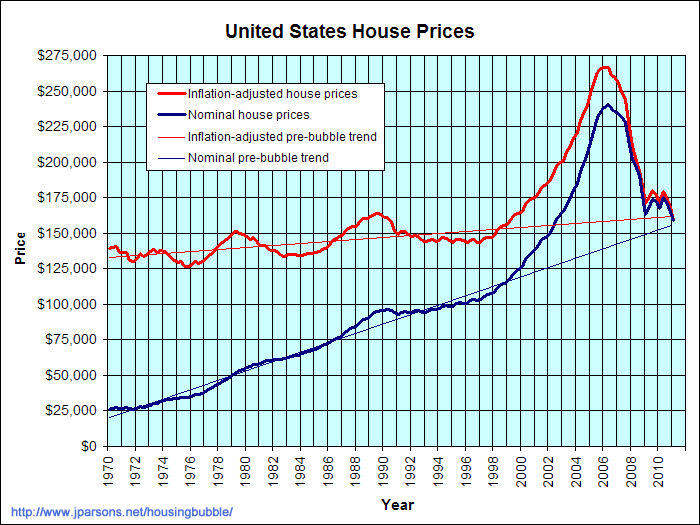 Here is a site with some nice graphs for prices over the last 40 years, and it's pretty clear to see that pretty much just what you were talking about happened, prices outpaced the ability of people to pay, which progressively locked out more and more first time buyers, and eventually that breaks the cycle, pops the bubble, and the prices adjust. I'd suggest changing the subject when your friends talk about real estate to save your sanity and friendship. There's a difference between "belief" and "knowledge". Arguing with a believer isn't a very productive course of action, and will ultimately poison the friendship. Reality is a harsh mistress. Not the answer you're looking for? Browse other questions tagged mortgage real-estate home-equity or ask your own question. 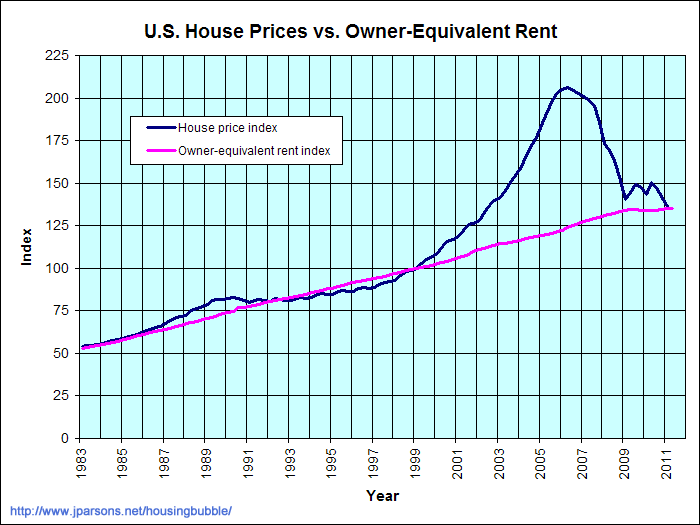 What argument(s) support the claim that long-term housing prices trend upward? What criteria should I use to determine if I should become a home owner? How to account for a shared mortgage in QuickBooks Online? How should we handle the house if it doesn't sell? I earn $75K, have $30K in savings, no debt, rent from my parents who are losing their home. Should I buy a home now or save? What explains high house prices in popular areas? I'm under contract for a house, but I'm moving away suddenly. Still purchase as an investment? Products for withdrawing from a home's equity?